Learning to send Morse code can require a lot of dedication, and with amateur licences available without Morse requirements, the motivation can get even tricker. Once you have the motivation, ways to practice tend to revolve around using a buzzer or other sounder to practice. But that's no fun, as you dont actually get any use out of the codes you transmit. What if you could learn morse whilst actually being productive and making something useful of it? That's what the Morse Keyboard is all about. This little project I built plugs into a computer's USB port and is seen by the computer as a standaard USB keyboard. As you tap out Morse, the device "types" each letter to your computer just like a standaard keyboard! Works with _any_ computer that supports a USB keyboard. No special applications required, works wherever you can type. Much easier to practice morse if you're using it to write, emails, etc. Your regular keyboard also works at the same time (eg for typing tricky characters). Emulates a standard USB keyboard. 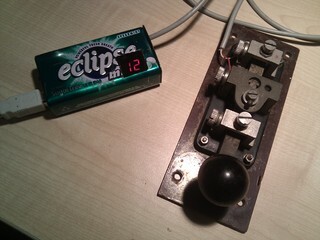 Uses an Eclipse mints tin as a housing. Dual 7 segment LED display (displays current WPM). Plug it into your computer. Your OS may report a new keyboard connected. Open up a blank text window, such as a text editor. Press the learn button. You will see "Learning. Enter "-.-.-"". Enter the Morse 'start' code, dah-di-dah-di-dah. The keyboard will report the dit and dah times, then drop into normal mode. Use the morse key anywhere you would use a keyboard! Your current speed will be displayed on the LEDs. Enter the number to select the option. Error (........) translates to backspace. SOS (prosign, ie no letter spaces) brings up the settings menu. Auto-space and auto-caps is enabled by default. For extras such as control, shift, etc, you can hold down this key on your regular keyboard whilst tapping the relevant letter. Eg control-c is done by holding control on your regular keyboard, whilst tapping 'c'. Edit MorseCodes.h to add others. Please see links on the left for more information on the device.